Below are bottle cap art from M3Girl Designs. We show 41 designs that were copied in full by M3Girl Designs and we are sure that there a lot more. So much for her "unique artwork" as claimed by her lawyer, D. Scott Hemingway, in what we call "perjurous laden" lawsuits he filed. An attorney has a responsibility to reasonably investigate the claims in a filing before signing it. In our opinion, not only did D. Scott Hemingway deliberately not include specific examples of alleged infringing artwork but he also attempts to expand copyrights to include ideas rather than the expression of those ideas. M3Girl Designs is very obviously infringing upon the trademarks of "Twilight" the movie and "Twilight" the books. M3Girl Designs claims the right to what appears to be clip art obtained from other sources or photographs downloaded (horses, cats and dogs). We doubt she obtained written permission for the photographs or took them herself. Her "Recycle" art is merely copied from other sources, etc. M3Girl Designs also appears to be infringing upon a number of copyrights such as the various "Schools" and "Camps" she imitates. In addition, M3Girl's four "Love" designs incorporate the "peace sign" she copied from Microsoft; the one other "Recycle" design is obviously copied; the two motorcycles, two of the "Horses" and the nine "Dogs are photographs which we doubt she took (probably copied); 19 there and we can point to another 67 images we do not believe Mad Maddie did herself but rather copied. That is at least a full 116 images we believe she copied from other sources out of 261 images on her web site as of December 30, 2009. And we are not counting the six sets of 7 bottle caps with "Initials" on them because they lack ceativity (42 more for a total of 160). That makes her at least 60% phony in our opinion. Do not forget the two infringing "Twilight" and four infringing "Jonas brothers" art works which are not included in the count. B-A-D Maddie. Maddie Bradshaw is a liar and a thief. As of September 10, 2012, we have court documents where it seems that Maddie Bradshaw admitted in her deposition that she copied artwork from Microsoft and other sources. We also have copies of emails sent to m3 girl designs by an artist citing copyright infringement because the Bradshaws were using her images without her permission. Most of the examples below have been removed from the inventory of m3girl designs. We wonder why? 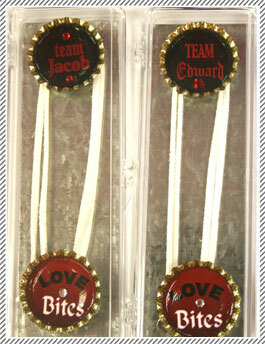 The top bottle caps say "Team Jacob" and "Team Edward", respectively, and the bottom bottle caps say "Love Bites". The "Team Jacob" and "Team Edward" bottle caps are direct infringements from the "Twilight" motion pictures and books. No where does M3Girl state that these are licensed products, nor do we believe that they are. Licenses almost always require that the licensee state that the item is licensed. The web site Tiara's Kids Boutique refers to these as "M3girl designs Edward Twighlight Collection". Disney must be thrilled to no end that a young and innocent little hustler like Maddie Bradshaw is using their intellectual property without paying royalties. Any of these four bottle caps by themselves is not infringing. However, and Maddie, there is always a "however" in life, the offering of these as a set are infringing upon the Disney rights to the Jonas Brothers.